64 W INTER 2018 PracticeLink.com features within days." D av id Hu r w it z , M . D. , a Ca l i for n i a- b a se d rheumatologist who has logged over 100 volunteer hours with The M A ve N Project, echoes this. "The patients have been waiting forever to see a rheumatologist, and they're very grateful for getting a consultation," he says. "Both the clinic staff and the patients seemed on the whole very grateful for my help." Hurwitz says volunteering through the The MA ve N Project has helped him carry out his passion for treating patients who otherwise couldn't see a provider. "I'm a big believer in extending medical care to the population as a whole," he says, adding that often there simply aren't enough physicians to see all the patients who need to be cared for. "I saw that there was some way to help meet that need, which is what M A v e N was structured for." Depending on what each clinic needs and whether a volunteer physician is licensed in the same state as the clinic, MA ve N volunteers may serve through direct consultations, curbside consultations or mentoring. In direct consultations, the physician builds patient relationships and consults on individual cases. This typically happens with more complex cases and requires a physician to be licensed in the same state as the patient. A day before each direct consultation appointment, Hurwitz says he typically gets a summary from a secretary, as well as access to electronic medical records. "A nurse would bring the patient in and introduce the patient to me," he explains. "Then I'd see the patient, and a doctor would come in, and I would discuss the diagnosis and the plan with the doctor." In curbside consultations, however, a volunteer physician is not directly involved with an individual patient. Instead, he or she offers advice about a panel of cases. "Each state defines it differently," says Shmerling. "It's as if you were in the office and you're getting a walk down the hall and you ask your pal, 'What do you think about this case?'" In mentoring relationships, a seasoned physician volunteer offers expertise to help clinic staff improve their services. 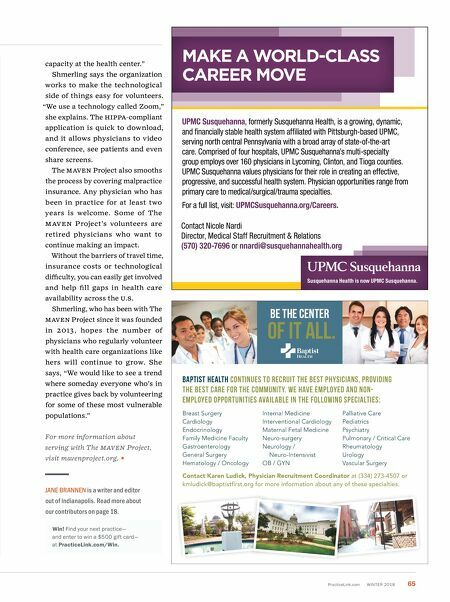 "You get paired up with a nurse practitioner, for example, on a regular basis," Shmerling explains. Mentees can use the sessions to learn about specific medical issues, get business advice or simply ask questions they have never had a chance to ask elsewhere. Says Shmerling: "Our ultimate goal is to increase the f our questions to ask a nonprofit organization before you volunteer Who will cover my malpractice insurance? Some organizations cover their volunteers' malpractice insurance, but others expect volunteers to coordinate and pay for this themselves. f ind out if you need to arrange coverage, and if so, ask your current insurer or employer if your existing policy will cover your volunteer activities. What licensing and immunizations do I need to complete? If you're treating patients out of state or out of country, you likely need some additional licensure and possibly special immunizations. The organization you volunteer with should be familiar with all of these processes, how much they will cost and how far in advance you need to start. King cautions that if an international organization's trip prices seem significantly low, they may be skipping crucial steps. "Registering the teams to be in the country with the ministries of health is of utmost importance," she says. "You need that comfort in knowing that the organization you're going with is a legitimate, above-board organization." What areas of medical expertise do I need to research ahead of time? Morrison recommends reading up on the region to become more familiar with common conditions in the area and, especially, how they may present. "You want to familiarize yourself," she says. "Sometimes things are very common, but they present differently." Can I speak with a volunteer who has done similar work before? Morrison also says it's always a good idea to speak with someone who has experience. "Talk to people who have gone on the trip if you can," she says. She's often contacted by new volunteers who want to make sure they're doing everything they can to prepare, and she's happy to help. "I'm always willing to talk to people, let them know what I've seen, what I've done."